1. Enter Numeric quantity for product which must not exceed available quantity. 2. 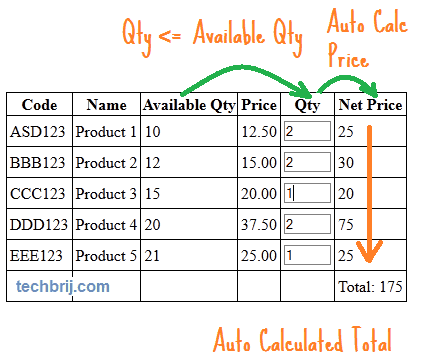 Calculate product wise total price based on entered quantity. 3. Calculate grand total of cart if any quantity is updated. Here you notice that different CSS are applied on different columns. It’ll be used in jQuery to get or set values. actually rite now im facing the issues from another framework that generate the rendered cilent id. really need your help for this. ps :: im currently using prado framework. Good Example. Have you tried it with a grid having more than 100 rows?